"BIG NEWS. The film is DONE. Yes, unbelievable but it is true. We've been breaking our backs for months on post production problems and issues, but finally, it's here. Emails and notifications have been sent to all the backers. They get FIRST SHOT at the film, being folks who helped us financially get this thing off the ground! Woo hoo. More announcements to be made, but we made it just under the wire, literally. 2015 was the 10th anniversary of the film Serenity .... and we release the digital version today to a select audience, making it officially a 2015 release. More information to come, but it's time to pop some champagne! You have not been forgotten." "Browncoats! I wanted to drop another update as we continue to get closer to finalizing the digital download of the film. I just sat down with Francis (the director) today and watched through about 30 minutes of finalized footage. It's looking amazing! I laughed, I cried, and I even yelled a time or two. Sound design is really punching the scenes with the right amount of ambiance, and color correction is making sure it all looks right. He's continuing to push out the scenes as fast as his computer will render, while cleaning up the odd rendering artifact here or there. The production crew is then watching each scene to look for anything we think should be fixed, and a last pass is made on the scene before calling it final. We'll keep doing this until every scene is finalized, which is looking like about a week given the processing time. We also discussed our upload strategy. A 96 minute full length high def feature film is an enormous file, and we want you to have the best quality version we can get you. We will be uploading the file behind a password protected site and an email will go out to backers to get their hands on the copy as soon as the file is uploaded and verified. We'll do the upload from a super fast internet location - turns out it would take 13 days from Francis' house. I ain't waiting that long! It will take about 30 minutes from a faster connection. Once it's all set, you'll be able to grab some popcorn, sit back, and settle in for a real treat of a story. Thanks for your patience. We're nearly there! " "You've been patient in waiting for the next film update, and we have one now for you! We are near the end of the post-production process: Finalizing sound, nailing down the score, correcting color, finishing a few CGI shots (we didn't have the budget for real spacecraft), and stitching the over 90 minutes of clips into the feature-length film. Last night, wearing my ninja pajamas, I stealthily entered the home of director Francis Hamada, and caught him asleep in his editing room! At 4am! Sleep is for the Alliance! I spiked his tea with an energy drink to help him through this final stretch, and snuck away with what he's been working on. I'm excited to present our first full length trailer! - Nathan "Ninja Pajamas" Rahn, AKA Buchanan"
Thanks for the status update. I was beginning to wonder. "Status update: Getting close to being done. Still waiting on some CGI shots (still the single most agonizingly slow process for the schedule), a few Audio dubbing lines from some of the actors, and a final pass for Color Grading and Sound Design. All Live action shots have been finished. Only a few 2nd unit insert shots to be done (screens, readouts, etc). Thanks to everyone for working so hard to make this into a full fledged 90 minute feature film. Now the remaining tasks are in the hands of third parties, so we will keep you updated as to our progress (aka 'their' progress)"
Browncoats: Independence War won best documentary at the San Diego Comic Con Film Festival! SHINY! I saw a Facebook posting to the Browncoats Independence War page a few days ago. People have just discovered the film and are asking when and where they are going to sell the dvds. Poor folks didn't read the fundraising info. Browncoats Independence War folks say they are researching legal ways to get more dvds out there. I'm going to be tacky - I GOT MINE COMING, too! Thanks for letting us know about this ... got mine! I'm surprised how few dvds of "Browncoats: Independence War" will exist when the fundraiser is over. The dvds will not be available for sale after the fund raiser ends. And that will be in a couple of weeks. They have met their target and all extra funding will go toward better special effects and music. They are nearly completed with Browncoats: Independence War. The first draft version will be screened at a venue just a short distance from the main Convention hall of San Diego Comic Con 2014 (on July 24th of this year!) Any of you lucky folks that get to see that, please let us know what you think! They are also raising money (and offering a chance to get a copy of the movie for those of us that missed the original kickstarter) in order to finish this very SHINY looking movie. 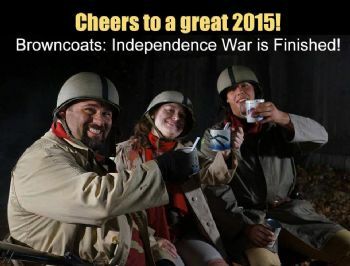 Browncoats: Independence War is still being filmed. I follow them on Facebook and the photos and short clips are incredible. I so wish I had discovered this before the Kickstarter had completed. It's fan made, so no telling when it will get done. Still it looks like folks that know something about the Firefly 'verse AND movie making are running it. I'm looking forward, too. Oooh, this looks like it will be good. I'm finishing Firefly now (again). Good timing! Thanks! "Browncoats: Independence War is a fan film based on the universe created in the Joss Whedon show "Firefly". It is a fan film effort by a group of Browncoats that span both Northern and Southern California, however the epicenter of this effort is based squarely in Northern California's Silicon Valley. It is a not for profit short, designed for contests, festivals and fan conventions. It is the April 3rd in the year 2511 A.D. For six months, 16 Combat Brigades of the Independence Army had held off a massive Alliance assault on the Planet Hera. They made their last stand in "Serenity Valley". After fighting for months, the final battle of Serenity Valley begins. This film deals with several squads of the 5th Battalion of the 76th Combat Brigade. The soldiers are tasked with a dangerous mission, to evacuate civilian refugees who have been caught in Serenity Valley before they are all killed by the inevitable Alliance assault." Fantastic clips and pictures of what is coming - SHINY!